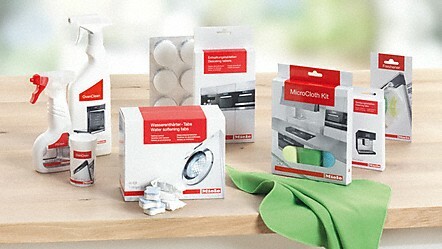 Made exclusively for Miele, the Care Collection offers a wide range of products to help you not only care for your laundry and dishware, but also ensure the best care for your Miele appliances. 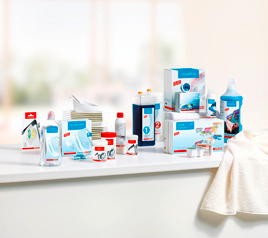 NS$V stocks the complete line of Miele Care Products and offers the same price in the store as you'll find online. What does the Cleaner do that the Conditioner doesn't do? Does my customer need both for cleaning their dishwasher? * "Dishwashers are exposed to a lot of food residue including starch and fats. Regular use of Miele dish washing machine conditioner will remove residual contaminates and can actually help extend the life of your machine and ensure great wash performance is maintained." * The Cleaner is useful for cleaning hard water limescale from washing machine Drums and dishwasher interiors. note: For busy machines, I suggest you practice this maintenance every 90 days.